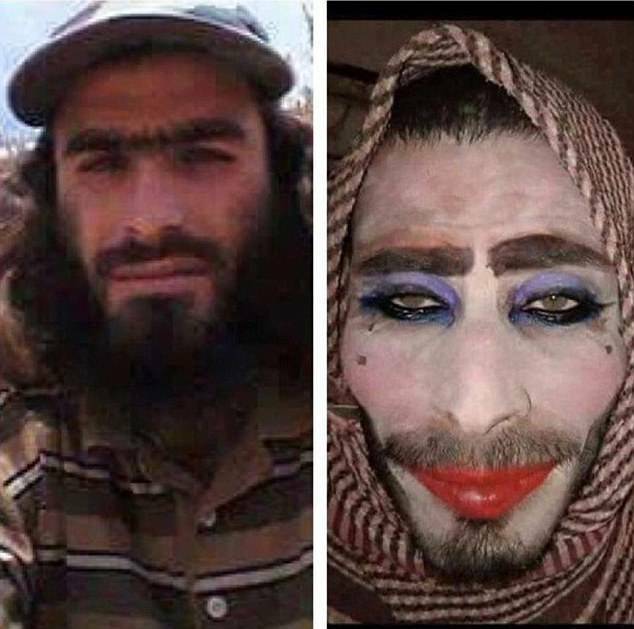 A Jihadist attempted to flee Mosul in a laughable amateurish attempt at cross dressing disguise, but was caught when he forgot to shave off his beard and mustache. The once tigerish ISIS fighter was trying to slink away from the former militant stronghold as the city was recaptured, but didn’t quite get his escape plan right. In photos released by the Iraqi army after his capture, the man can be seen to have slathered on foundation, eyeshadow and lipstick, even adding some beauty spots. Other photos released by the army show the men in padded bras as they try to slip through the government drag net and flee the city. Iraqi army show the hapless attempts by men who are trying to get out of the city to look like women, including wearing padded bras. One [left], had a full make-over complete with red lipstick and heavy eye shadow. One shame-faced fighter captured by Iraqi forces had a full make-over complete with red lipstick and heavy eye shadow. He was also wearing a bobbed wig and padded lacy white bra for added realism. However, he’d neglected to shave his chest hair, which was clearly visible through his cream-coloured top. Mosul’s Old City, which once stood as a neighborhood of densely built alleyways and homes on winding lanes, has been reduced to rubble by a months-long war to root out the Islamic State. The effect of the battle, which ended asJihadists made their last attempt to hold on to the region earlier this month, can be seen in stark before-and after satellite photographs. Much of the Mosul is rubble with dust covering what was once a thriving neighborhood in Iraq. Nearly a third of the Old City – more than 5,000 buildings – was damaged or destroyed in the final three weeks of bombardment up to July 8, according to a survey by UN Habitat using satellite imagery. A once thriving historic city now in ruins – Damage from bombardment in Mosul, as the residents try to rebuild from the rubble. It took Iraq’s US-backed forces nearly nine months to wrest Mosul from the Islamic State group, and the cost was enormous destruction, especially in the western part of the city. Mosul was finally liberated on July 10. Mirsur Dannon Hassan, 53, said his house had been destroyed in an air strike. ‘I don’t have a salary. I need help to rebuild it,’ he said. He was living in rented accommodation with his wife, five daughters and son in the east but the landlord had just doubled the rent from $100 per month to $200. Survivors recall that life was miserable under Islamic State, also known as Dash, which seized Mosul in July 2014 which they declared the capital of a self-styled caliphate spanning parts of Iraq and Syria. Despite their departure, the terror unleashed by the ISIS fighters remain with the population. Safwan al-Habar, 48, who has a house in al-Zinjili district, had spent a morning seeking help for a particularly alarming problem – Islamic State had booby-trapped his house. ‘Two bombs attached to each other with wire. If you put your leg on it, it will explode,’ he said. Even the boots on the ground are skeptical calling the conflict entirely over, Pentagon chief Jim Mattis said on Friday that he believes Islamic State chief Abu Bakr al-Baghdadi is still alive, following various claims he was dead. He said: ‘I think Baghdadi’s alive… and I’ll believe otherwise when we know we’ve killed him. The Britain-based Syrian Observatory for Human Rights, a longtime conflict monitor, last week said it had heard from senior Islamic State leaders in Syria’s Deir Ezzor province that Baghdadi was dead. With no verified sighting of his demise, Russia’s army said in mid-June that it was seeking to verify whether it had killed the IS chief in a May air strike in Syria. The $25 million US bounty on Baghdadi is still in play. Rumored to move regularly throughout IS-held territory in Iraq and Syria, it is not surprising he has kept a low profile. The Iraqi native has not been seen since making his only known public appearance as ‘caliph’ in 2014 at the Grand Mosque of Al-Nuri in Mosul. His men blew up the iconic historic Mosque before advancing government forces entered Mosul.